This 2-Port USB to RS-422/485 serial adapter allows you to add two RS-422 or RS-485 serial ports by connecting to a USB port. This adapter offers 2000V optical isolation and 25KV ESD surge protection. Supplies 2000V optical isolation and 25Kv ESD surge protection to serial ports. High-Speed Communication with 128 Byte FIFO. Installs as a Windows COM port. Selectable RS422 / 485 operation via unobstructed access to DIP Switches. USB to RS-422 / RS-485 technology is the perfect compliment to serial communication to further the use of existing devices, even when the computer doesn’t offer serial ports. The USBG-2COMi-SI-M USB to RS-422 serial adapter has 128 byte FIFO to allow high-speed communication, even in heavy loaded systems. This USB to RS-422 serial adapter also allows you to protect your equipment via 2000V optical isolation and 25KV ESD surge protection. Two 6-pin terminal block connectors located on either side for optimal flexibility of serial connection. 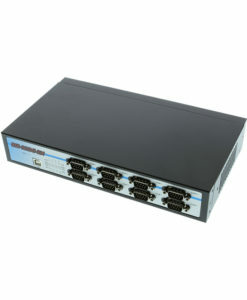 This 2-Port serial adapter allows you to add two RS-422 or RS-485 serial ports by connecting to your host USB port. The adapter features a rugged SECC metal chassis, which also includes DIN rail brackets for mounting. Serial COM modes settings, RS-422 or RS-485 are selectable for operation via DIP switches located on the back of the adapter.